LAS VEGAS—The theme of the 63rd annual Choice Hotels Convention is “Future Ready.” And with more than 5,000 hotel franchisees in attendance, the company outlined the steps it’s taking to prepare for the future in its general session. CEO Steve Joyce stressed how important the government’s role is when it comes to hospitality’s future. “The new administration will implement policies that affect all of us here in our businesses, as employers and as taxpayers. As leaders in the business community, we have a special responsibility to advocate for policies that will help the economy grow and provide security and prosperity for everyone,” he said. 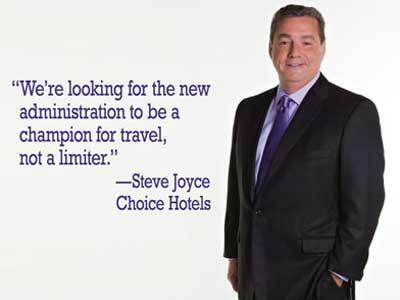 “Choice Hotels is hopeful that the president will move forward with a pro-business agenda. This includes promoting a fair business environment to encourage the growth of franchise businesses and supporting an improved travel infrastructure that includes airports, roads and bridges. To beat the competition and become future ready, the company highlighted several initiatives: Choice University, the online learning system for hotel managers and staff, will later this month launch a newly enhanced website designed to create a more tailored hotel learning portal and new training delivery approaches, as well as provide a better user experience with more intuitive search and navigation; a next-generation, cloud-based reservation system, which will roll out this year; its proprietary revenue management tools—ChoiceRM and SmartRates; and Badda Book. Badda Boom, which is a new integrated advertising campaign that encourages consumers to book directly through ChoiceHotels.com or the Choice mobile app for the lowest prices guaranteed and instant rewards.